Food Addiction Help. Are you using food to control your feelings? Has it become a vicious circle of pain, pounds and guilt that doesn’t seem to stop? There are ways to take control and break old habits with healthier ones that can help set you free. 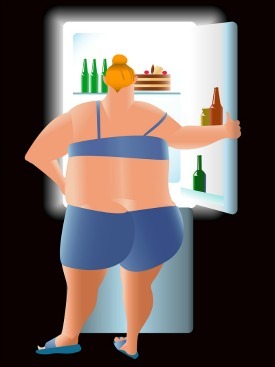 Quite simply the definition of food addiction is a condition where a person develops an unhealthy relationship with food such as uncontrolled eating, over eating or bingeing. So What Makes Us Over Eat? Just as with any addiction you must address the circumstances and emotional ties that created this need to alter our mood. After all, isn’t that why we over indulge, to change the way we feel? You’re not alone. For me it became a vicious circle. Over eating led to weight gain which led to guilt, frustration and lower self esteem which led right back to eating to change the way I felt. In order to win the battle over food addiction one must dig deep (some of us deeper than others) to find out what the real catalyst is in our lives that started this whole process. As kids we eat what our parents provide for us. So, for those of us whose parents made poor food choices growing up, guess what, you may still be eating the same types of foods. Convenience and processed foods can be highly addictive because they are loaded with tasty fats, sugars, salts and additives. Though they may be filling, comforting and satisfying to the pallet, they are also loaded with calories and offer little nutritional value to properly fuel our bodies. If we choose to over indulge in unhealthy food choices then obesity and health issues are soon to follow. Let’s face it, if we were to stuff our faces all day long with fruits and vegetables it would be difficult to gain excess weight. Healthier foods provide healthier calories. It is also important to know which foods provide good sugars which offer calories for energy and are also rich in nutrients. Foods containing bad sugars should be avoided as they are empty calories offering little or no health benefits. Yes, the good old saying that 3 square meals a day is all you need may just be the answer. Eating a healthy breakfast, lunch and dinner at a similar time every day is a great way to control the amount you eat. If you’ve ever been to France you will be surrounded by fresh baguettes, soft butter, delicious meals followed by decadent desserts. On my trip there I had eaten so much bread plastered with fresh butter that I broke out with a skin rash, talk about bingeing. But amazingly with all that mouth watering food, the obesity rate is still reasonably low in France. That’s because the French people stick to regular meal times and rarely snack between meals. As I watched a typical French family at dinner they seemed to enjoy and savor every bite. Perhaps they don’t rush their meals because a typical meal served in France is not large in size. Let’s just say they don’t believe in supersizing their meals. This makes sense because large meals are harder on the digestive system and liver function which can increase weight gain. Smaller portions means less work for your body, similar to how the food combining process works for digestion times. Food Addiction Help - Got to Have a Snack? If you must snack between scheduled meals then make it a healthy one. Choose fresh foods which are rich in vitamins and water content that provide your body with real energy. Healthy snacks may include fresh fruit, salad or perhaps a veggie tray with a little dip or my favorite, a small cup of homemade soup. Making even small changes can create great results over time.